[125 Pages Report] The contrast injectors market is projected to reach USD 636.1 Million by 2021 from USD 445.5 Million in 2016, growing at a CAGR of 7.4% during the forecast period. The contrast injector market growth can primarily be attributed to factors such as the large number of approvals for contrast agents in different geographies and increasing number of public and private diagnostic centers. On the other hand, the side effects and allergic reactions associated with contrast agents are expected to limit the market growth to a certain extent. In the coming years, the contrast media injector market is expected to witness the highest growth rate in the Asia-Pacific region. The high growth in the region can be attributed to the rising approvals for various contrast agents in Asia-Pacific countries, developing markets, and the growing presence of international players in this region. In addition, the availability of government support for research, high healthcare expenditures in APAC countries, rising aging population, and increasing cancer incidences are expected to support the growth of the Asia-Pacific contrast injector market. On the basis of product, the contrast injector market is categorized into injector systems, consumables, and accessories. In 2016, the consumables segment is estimated to account for the largest share of the contrast injector market. This growth is mainly attributed to the recurring use of consumables in diagnostic procedures to maintain hygienic conditions. The injector systems segment is further divided into CT injector systems, MRI injector systems, and angiography injector systems. In 2016, the CT injector systems segment is expected to command the largest share of the market. The MRI injector systems segment is expected to grow at the highest CAGR during the forecast period. The consumables segment is further divided into injector heads, syringes, tubing, and other consumables (scan bags, valves, vials, and spikes). In 2016, the injector heads segment is estimated to account for the largest share of the consumables market. The injector heads segment is further categorized into single head injectors, dual head injectors, and syringeless injectors. The single head injectors segment is expected to command the largest share of the market, in 2016. The syringeless injectors segment is projected to grow at the highest CAGR during the forecast period. On the basis of application, the contrast injector market is segmented into radiology, interventional cardiology, and interventional radiology. The radiology segment is estimated to account for the largest share of the global market in 2016. Factors such as the increasing use of contrast agents in various diagnostic procedures/centers are expected to drive the contrast injectors market for radiology applications. The interventional cardiology segment is expected to grow at the highest CAGR during the forecast period. On the basis of region, the market is segmented into North America, Europe, Asia-Pacific, and the Rest of the World (RoW). In 2016, North America is estimated to account for the largest share of the contrast injector market, followed by Europe and Asia-Pacific. However, the Asia-Pacific market is expected to grow at the highest CAGR during the forecast period, and also serve as a revenue pocket for companies offering contrast injectors. The prominent players in the global contrast injector market include Bracco Imaging S.p.A. (Italy), Bayer HealthCare (Germany), and Guerbet Group (France) in 2015. These companies are dominant in the market mainly due to their well-established presence in the field of contrast injector, presence in over 50 countries, high R&D investments, and strong sales and distribution force. Other players include Medtron AG (Germany), ulrich GmbH & Co. KG (Germany), GE Healthcare (U.S.), AngioDynamics (U.S.), Nemoto Kyorindo Co., Ltd. (Japan), Sino Medical- Device Technology Co., Ltd. (China), VIVID IMAGING (China), and Apollo RT Co., Ltd. (China). On the basis of application, the global contrast media injectors market is segmented into interventional radiology, and interventional cardiology applications. The radiology segment is expected to account for the largest share of the global contrast media injectors market whereas the interventional cardiology segment is expected to grow at the highest CAGR. The growth of the market can be attributed to the high global CVD burden. According to the World Heart Federation (WHF), by 2030, nearly 23.6 million people are predicted to die worldwide from CVD. This is leading to an increase in the demand for cardiac intervention procedures and coronary diagnostic procedures. The global contrast media injectors market is expected to reach USD 636.1 million by 2021. 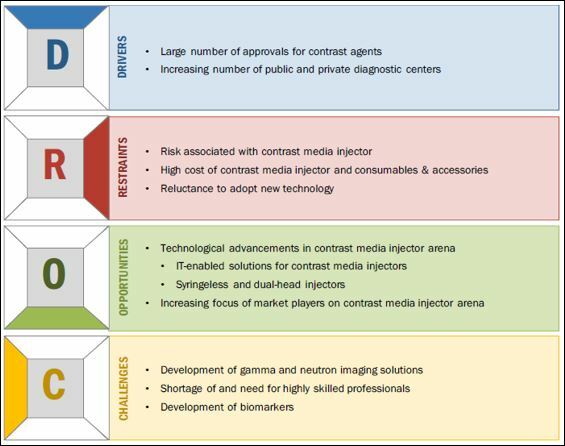 Factors such as increasing number of approvals for contrast agents, increasing number of public and private diagnostic centers, technological advancements in the contrast media injector arena and the increased focus of market players in the injector technology provide high growth opportunities for players in the global contrast media injectors market. Development of gamma and neutron solutions, need for highly skilled professionals, and the development of biomarkers, are the major restraints for the market. A major concern with automated systems is that it is not preferred over manual contrast injectors. Manual contrast injectors account for the largest share of the available contrast media injectors in the market. It is one of the preferred methods to inject contrast media by radiologists in diagnostic labs. In addition, the cost of manual injectors is very low as compared to automatic injectors. Therefore, hospitals avoid the use of automatic injectors for cost saving. Venous air embolism is a major risk associated with the pressure injector syringes and its tubes. Various effects of air embolism include air hunger, dyspnea, cough, chest pain, pulmonary edema, tachycardia, hypotension, or expiratory wheezing. This may also result in neurologic deficits, for example stroke, due to the decreased cardiac output or paradoxical air embolism (Source: 2016, American College of Radiology U.S. Manual). Other risks associated include sepsis which may be caused by improper handling of contrast agent syringes. Such risks associated with the use of contrast media injectors are restraining their usage and thus, restricting the growth of the market to some extent. However, the drawbacks of manual devices like wastage of contrast media, and chances of contamination as well as technological advancements like syringeless and dual-head injectors and IT enaenabled contrast media injectors are likely to offer lucrative growth opportunities for players in the contrast media injectors market. Large number of approvals for contrast agents and technological advancements in the field of injector technologies are some of the factors driving the demand for CT injector systems. Market players such as Guerbet Group (France) and Bracco Imaging S.p.A (Italy) have introduced syringeless injectors for CT scanners. Increasing focus of market players to introduce technologically advanced injector systems is driving the demand for MRI injector systems. For instance, in November 2016, ulrich medical (Germany) launched two new syringeless MRI contrast media injectors, Max 3 and Max 2M. Both these products are more efficient in comparison to conventional injectors. Furthermore, market players such as Nemoto Kyorindo Co., Ltd. (Japan), Bracco Imaging S.p.A (Italy), and Guerbet Group (France) provide IT-enabled injector solutions. Hospitals can connect MRI scanners and contrast media injectors to the Hospital Information Systems (HIS) or Electronic Medical Record (EMR), and access patient data from Picture Archiving and Communication Systems (PACS). Angiography injectors are used in procedures to examine the coronary and renal arteries, and vasculature of the heart, abdominal organs, brain, and extremities. Market players operating in the field of angiography injector technology have introduced advanced angiography injector systems. For instance, ulrich GmbH & Co. KG (Germany) developed Adam, an angiography injector that is increasingly utilized in angiography procedures. Similarly, Angiomat Illumena by Guerbet Group (France), Medrad Mark 7 Arterion Injection System by Bayer AG (Germany), and PRESS DUO by Nemoto Kyorindo Co., Ltd. (Japan) are some of the significant angiography injector systems. The injector heads segment accounted for the largest share of the consumables market. This large share is mainly driven by the growing requirement of consumables to maintain safety and hygienic conditions during diagnostic procedures. Consumables are of single use and easily disposable. They need to be re-purchased for every new procedure as opposed to instruments. The injector heads segment has been further segmented into single head, dual head, and syringeless injectors. Single head injectors are widely used in CT scans and cath labs that perform angiography procedures. These procedures prefer the use of single head injectors, as they avoid air embolisms. Single head injectors require constant monitoring; wastage of contrast agent serves to be a major factor adding to its disadvantage. Hospitals and radiologists utilize dual head injectors. These injectors require high-pressure and variable flow rates with one head of saline injection to open the veins and other head to inject contrast. This significantly reduces the wastage of contrast agents, thereby reducing the cost of diagnostic procedures. Due to the advantages offered by dual head injectors, radiologists prefer the usage of dual head injectors in comparison to single head injectors. However, with the increasing number of CVD cases, the market for single head injectors is likely to sustain in the coming years. Dual head injectors are designed to intravenously inject saline and contrast agents in the patient’s body. The process involves injecting saline, before and after the contrast agent is injected. The simultaneous flow of saline and contrast agents avoids wastage of contrast agents, thereby reducing the cost of diagnostic procedures. CT scans in hospitals specifically use dual head injectors; the first injector head injects contrast agents and the second head allows the saline to flush and keep the contrast agent flowing in the patient’s body. Moreover, dual-head injectors are efficient in terms of contrast delivery and avoids air embolism. Syringeless injectors or syringeless power injectors have gained popularity, as hospitals are focusing on improving operational efficiency and reducing the cost of diagnostic imaging procedures. According to the U.S. Joint Commission, the reuse of unused doses from single-use syringe injectors is banned. Syringeless injector is composed of a softbag, which consists of contrast agent, connected to a hydraulic pump, and tubes to deliver contrast agents to patient. Syringeless injector facilitates the opportunity to utilize contrast agents as efficiently as possible, thereby decreasing contrast media wastage. Syringeless injectors are widely used in combination with CT and MRI scanners. Market players have introduced syringeless injector compatible with imaging modalities. For instance, in November 2016, Bracco S.p.A (Italy) received an approval from FDA for its syringeless CT injector, CT Expres 3D. Similarly, in November 2016, ulrich GmbH & Co., KG (Germany) launched two new syringeless MRI contrast media injectors, Max 3 and Max 2M. Which product segment is likely to drive the growth of the global contrast media injectors market? What will be the impact of the rise in the number of patients with chronic diseases? How are syringeless and dual-head injectors likely to drive growth? 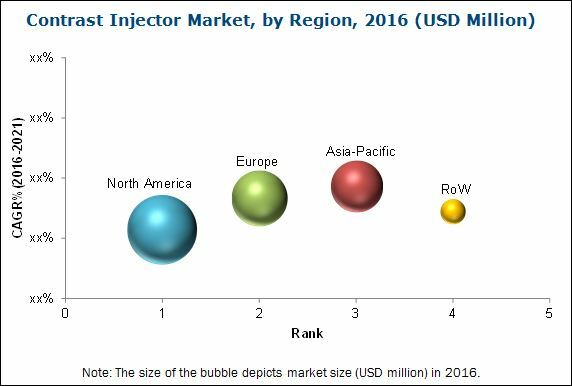 The contrast injectors market is projected to reach USD 636.1 Million by 2021 from 445.5 Million in 2016, growing at a CAGR of 7.4% during the forecast period. The contrast injectors market growth can primarily be attributed to factors such as the large number of approvals for contrast agents in different geographies and increasing number of public and private diagnostic centers. On the other hand, the side effects and allergic reactions associated with contrast agents are expected to limit the market growth to a certain extent. The global contrast injectors market is segmented on the basis of application, product, and region. Based on application, the contrast injectors market is segmented into radiology, interventional cardiology, and interventional radiology. The interventional cardiology segment is projected to grow at the highest CAGR during the forecast period. However, the radiology segment is expected to command the largest share of the contrast injector market in 2016. Based on product, the market is categorized into injector systems, consumables, and accessories. The injector systems category is further segmented into CT injector systems, MRI injector systems, and angiography injector systems. The CT injector systems segment is expected to command the largest share of the market in 2016. The MRI injector systems segment is projected to grow at the highest CAGR during the forecast period. The consumables segment is expected to account for the largest share of the market in 2016. The growth of the consumables segment can largely be attributed to the recurring use in every procedure conducted. The consumables segment is further segmented into injector heads, syringes, tubing, and other consumables (scan bags, valves, vials, and spikes). The injector heads segment is estimated to account for the largest share of the consumables market in 2016. The injector heads segment is further divided into single head injectors, dual head injectors, and syringeless injectors. The single head injectors segment is expected to command the largest share of the market in 2016. The syringeless injectors segment is projected to grow at the highest CAGR during the forecast period. Based on region, North America is expected to account for the largest share of the global contrast injector market. North America’s leadership position in the market can be attributed to the increase in the number of diagnostics imaging centers and tests, rising prevalence of chronic diseases, increasing aging population in the U.S., increasing number of cardiac arrests, and rising incidence of diseases. In the coming years, the contrast injector market is expected to witness the highest growth rate in the Asia-Pacific region. The high growth in the region can be attributed to the rising approvals for various contrast agents in Asia-Pacific countries, developing markets, and the growing presence of international players in this region. In addition, the availability of government support for research, high healthcare expenditure in APAC countries, increase in aging population, and increasing cancer incidences are expected to support the growth of the Asia-Pacific contrast injector market. Key players in the global contrast injectors market include Bracco Imaging S.p.A. (Italy), Bayer HealthCare (Germany), Guerbet Group (France), Medtron AG (Germany), ulrich GmbH & Co. KG (Germany), GE Healthcare (U.S.), AngioDynamics (U.S.), Nemoto Kyorindo Co., Ltd. (Japan), Sino Medical- Device Technology Co., Ltd. (China), VIVID IMAGING (China), and Apollo RT Co., Ltd. (China). 10.4 Ulrich GmbH & Co. Kg. 10.7 Apollo RT Co., Ltd.